The design for Rhiannon's summer top is developing. After after a swatch I usually make a little drawing of the jumper noting down all the features the jumper should have. Rhiannon requested a v-neck, which is easy to do because it goes with the fishbone pattern; set in sleeves, and no ribbing. The drawing is not anything set in stone, just a guide. Designing for me only finishes when the piece is finished. Rhiannon commissioned a green, short sleeved summer jumper. Something with columns and fishbones. 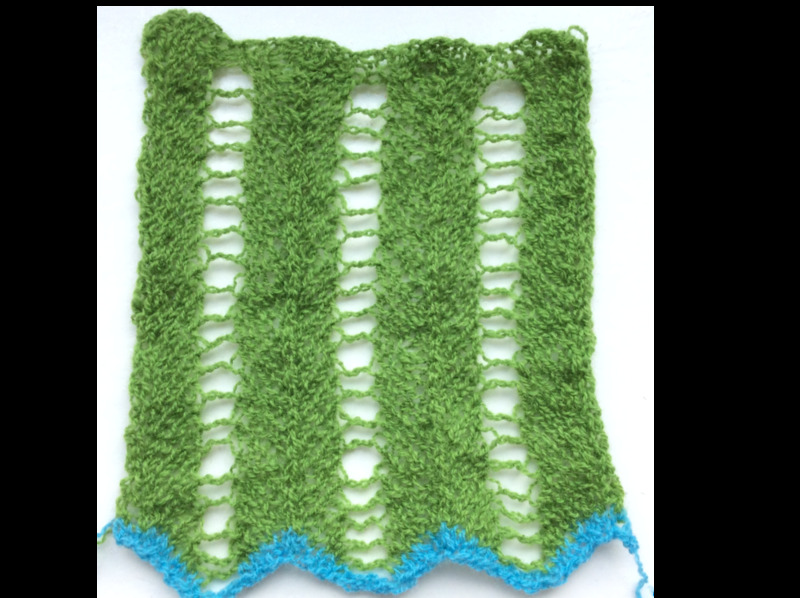 Here my first swatch: something with columns and fishbones. The yarn is an old lambswool jumper that I bought in a charity shop ages ago. It's very thin yarn. The right thing for summer. The only thing that bothers Rhiannon a tiny bit is the size of the holes, but I think I've got a way to make them smaller. The next step is to explore what sort of style of jumper she would like.